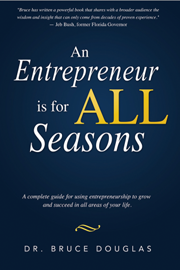 An Entrepreneur is for All Seasons: A complete guide for using entrepreneurship to grow and succeed in all areas of your life. Enrich Your Entrepreneurial Spirit. We all desire to be masters of our own destiny, to have complete control and freedom in our lives. As author Dr. Bruce Douglas knows firsthand, this entrepreneurial attitude can inspire you to transform your life and the lives of everyone around you. As a child, Bruce lived and worked through the Great Depression, learning some of the most basic lessons that would eventually lead him to found his own company. An Entrepreneur is for ALL Seasons recounts Bruce’s struggles and life lessons as he shows you how to develop the skills to create real change in your business and beyond. To get there, you must think outside the box, take risks, bypass the conventional chain of command, and learn from your failures as much as from your successes. Through self-reflection, proper guidance, knowledge, honesty, and effort, it really is possible to achieve your desires. Let Bruce’s experiences and advice inspire you as an entrepreneur and leader to take your skills and success to new heights.